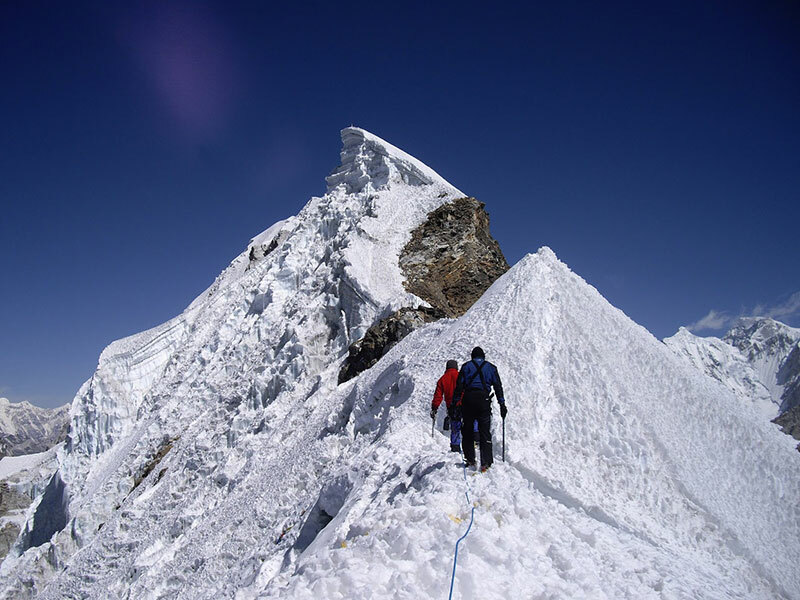 Mera Peak lies at the elevation of 6647m, is considered the highest trekking peaks in Nepal. A demanding trek with climbing lies in the lower Khumbu region and is suitable for experienced trekkers looking for some challenging adventure. Our itinerary takes you to Mera Peak via Lukla however another option by either flying to Phaplu or driving to Phaplu is also possible passing through the beautiful villages. The itinerary is prepared ensuring proper acclimatisation and providing rewarding views from the summit of many 8000m peaks including Mt. Everest, Cho Oyu, Makalu, Kanchenjunga and Nuptse. Trek through the rhododendron forest that blooms specially during the spring time. Pass through the Mera glacier towards the Mera high camp. Summit Mera Peak and enjoy stunning views of the panoramic Himalayas. Fly to Phaplu (2930m). Drive to Adheri and trek to Khari khola (2040M) – 6 hrs drive / 3 hrs trek. We will be transferred to domestic airport for our 25 minutes flight to Phaplu where our staff will be waiting for us. The route from Phaplu to Ringmo previous used to a trekking trail, however with the road being built, we can choose to drive upto Ringmo from where we will start our trek to Taksindo through the rhododendron forest. We will stay in a lodge near monastery for the overnight. After an early breakfast we continue our trek over a steep ascending trail that heads for passing through Bupsa towards crossing the Poyan Khola as we ascend towards Khari La which lies at the elevation of 3081m as we pass through different village of Kharte, Nyungso to arrive at a beautiful village at Pangom. After an early breakfast, we have a day hike to the monastery. We head towards Ning So as we ascent Nankung La (3110m) as we get a superb view of Mera Peak before descenting towards Sibuje (2770 m) as we arrive at a nice camp at Ning So. We start with a steep climb up to an elevation of 3280 m from where we get amazing views and continue the climb until we reach the top to take a descent until we arrive at the lunch spot near the river at the elevation of 2850 m. We continue our trek to arrive at the Bamboo forest where we will spend over night in a lodge. Today, we advances through the dense forest filled of Rhododendron, oak, pine and juniper trees.During our trek today we will be seeing amazing views of Mera Peak and surrounding snowcapped peaks. We will take a steep descent to the Hinku River and a final uphill climb will lead us to Kothe. It lies to the west side of the Hinku Valley, and offers pure wilderness with lush vegetation to trekkers. The route will pass through Lungsumgba Gompa which was built approximately 200 years ago. Here, we can find the Mera Peak along with its route scripted in rock which is fantastic piece of rock carving architecture. Thetrek continues with a rather easy walking route that leads to the summer grazing area of Thangnak where there are shops and number of good tea houses. Today, we will acclimatize and local hike in this wonderful settings surrounded bystunning peaks, especially Peak 43. The north from camp there is a huge moraine behind which is gorgeous lake known as the SabaiTsho, into which plummets the hanging Sabai Glacier wellworth exploring with time spent will help you to acclimatize well. After the amazing time at Thangnak, today our tail goes over the lateral moraine towards Hinku Nup and Shar Glaciers. From there our further trekking is a steep climb all the way to Khare.We will be facing magnificent view of Northern side of Mera Peak. Leaving Khare, we will advance towards Mera peak base camp. Out trail gradually ascend over to Mera Glacier. We will climb steeply towards the top of the glacier before traversing along the glacier to finally arrive at Mera peak base camp. Again after the camp, we will advance and follow the trail hat climbs over through Mera La pass and continue trekking along rocky and often snow covered tails towards Mera Peak High Camp. The route crosses the bowl and then climbs the ground to the right of the tongue to a large rock platform beside the glacier after another careful walk. 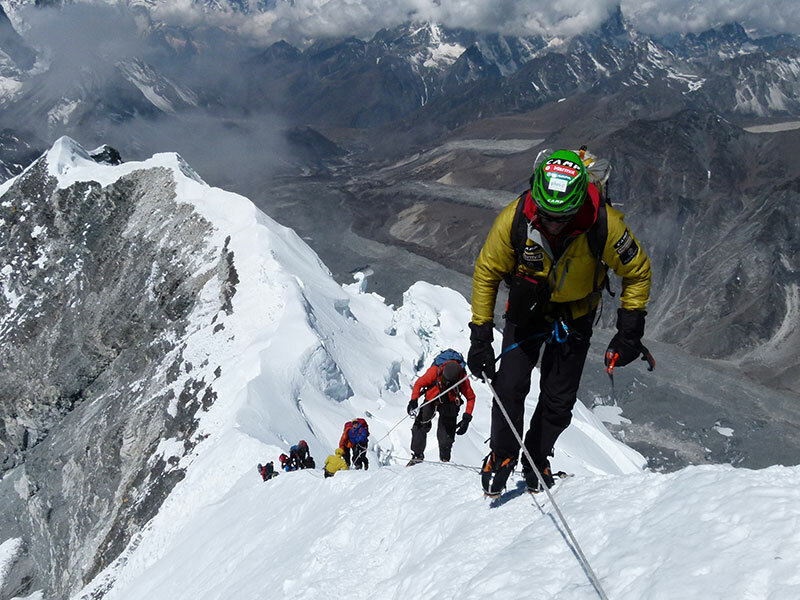 Once at the high camp our Sherpa crew will quickly set up the camps and make necessary check on our climbing gears. From the high camp site, we can enjoy the amazing views of Everest, Makalu, Nuptse, Cho Oyu, Baruntse and Chamlanag. Big day indeed!. We have to start early morning for the summit of Mera Peak. Properly equipped and fully acclimatized we start early with the aim to reach the summit before noon. Strong windsafter mid-day can created obstacles in reaching the summit. We will start around 2 am in the morning after having breakfast. We will begin to climb up the glacier and onto a ridge. By following thefootsteps and guidance of our experienced climbing expert, we advance towards the Mera Peak summit.Once the top, we are rewarded with magnificent views of Mt. Everest, Mt, Cho Oyu, Mt. Makalu, Mt. Kanchenjunga,Mt. Nuptse, Mt. Chamlang. After spending some quality time at the peak we will descend the same route and headback to reach khare for our overnight stay. Today we will start retracing our steps from Khare and trek through Thangnak before advancing towards Kothe.With mostly downhill trekking, we will leave high altitudes behind and enter into the dense sub-tropical forest filled with rhododendron, Oak, Pine and birch trees. Today we will be leaving Kothe behind and go through uphill trekking which goes over the western section of Hinku valley towards Chetrawa La. The last day of our trekking begins crossing Zatrawa La pass via Thuli Kharka and from the top of the pass we start descend back to Lukla. In the evening, we will be celebrating together with our crew for successful summit of Mera Peak. We will enjoy our last view of the high mountains while flying back to the Kathmandu from Lukla. The snow-capped mountains will be worth to watch. After 25 minutes of flight our representative will be waiting for you at domestic airport to take you back to the hotel where you can enjoy your chilled beer and warm shower. You’ll have a day free in Kathmandu Valley and enjoy your time. Day 2 : Fly to Phaplu (2930m). Drive to Adheri and trek to Khari khola (2040M) – 6 hrs drive / 3 hrs trek.